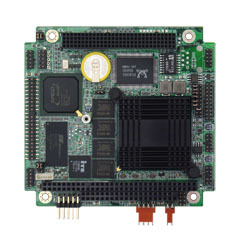 The Mercator II PC/104-Plus module integrates 4 PCI-based 10/100 Ethernet ports with 24 user-configurable digital I/O lines in the compact and rugged PC/104 format. This 2-in-1 combination of Ethernet and digital I/O can help lower the size and cost of your embedded system by eliminating one additional board from your PC/104 stack. 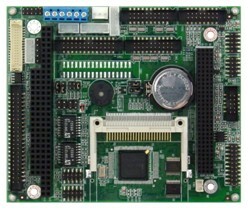 The Ethernet ports are driven by two dual Micrel KSZ8842 Mac + Phy PCI controller chips, two ports per chip, and are NE2000 compatible. Each chip has a unique MAC address; therefore, only two Ethernet ports are visible to the end user for active communication. The other two ports work in switch fashion to enable daisy chaining of networks with one port on the chip as an uplink to a network while the other port provides active communication on the network. The 24 digital I/O lines are based on an 82C55 chip and feature programmable direction in 4- and 8-bit groups. All I/O lines contain user-configurable 10K ohm pull-up resistors for convenience. Extended temperature capability (-40ºC to +85ºC) enables the board to operate in environments with extreme temperature swings, such as vehicles or outdoor installations. In addition, the board may be custom-configured with 0-ohm resistors in place of jumper blocks for increased ruggedness in high-vibration environments. Diamond Systems offers appropriate mating cables for your convenience. Cable number C-PRZ-02 provides a panel-mountable RJ-45 connector for the Ethernet, and cable number C-26-18 is a 26-conductor ribbon cable for the digital I/O. Several features are configurable using either a dual-row 2mm size jumper block or a switch. Provision is made on the board for zero-ohm resistors to replace jumpers to enable a hard-wired configuration. This pin header is a locking 1x6 position right-angle header. The pinout is compatible with Diamond Systems' cable number C-PRZ-02, which provides a panel-mountable RJ-45 jack. The digital I/O is provided on a 26-pin (2x13) pin header with the following pinout. The following I/O addresses are selected with jumpers or 0-ohm resistors. All addresses are in hex. Direction Programmable: Ports A and B individually programmable for all input or all output.